What do Barack Obama, Samuel Beckett, Fidel Castro, Joan Baez, Conan O’Brien, Natalie Portman, and Dwight D. Eisenhower have in common? Their footsteps have all crossed paths in Harvard Square. This well-trod patch of Cambridge turf, in the backyard of Harvard University, has long been a crossroads where poetry, retailing, politics, design, performance, and every other cultural endeavor intersect. 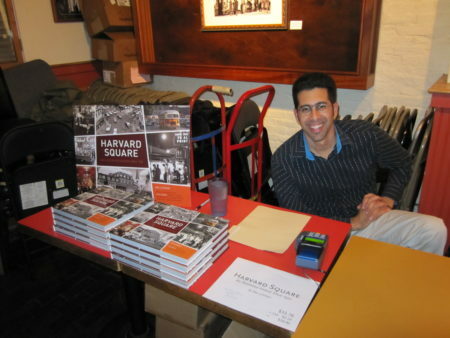 From the Square’s tweedy aspect in the 1950s through its many transformations in the ’60s, ’70s, and beyond, author Mo Lotman gives a decade-by-decade account of Harvard Square’s history, traditions, and lore. The bookstores, the billiard parlors, the barbershops, the booze and burger joints: they’re all here. 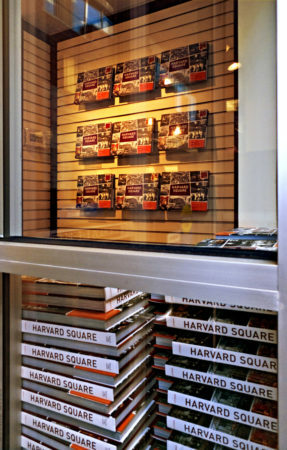 Based on interviews with more than a hundred of the Square’s denizens, illustrated with archival photographs, and graced with texts by John Updike, Bill McKibben, Governor Bill Weld, and others, Harvard Square brings “the smartest urban space in America” to vivid life. Mo Lotman is a freelance writer and publisher of The Technoskeptic, and speaks publicly on the topic of technology and society. Harvard Square: An Illustrated History Since 1950 is his first book. A professional voice talent whose underwriting announcements can be heard on Boston’s local public radio 89.7, Mo wrote and voiced his own radio piece about Harvard Square for NPR’s All Things Considered. For more about Mo, visit molotman.com. Read more of the massive buzz on Harvard Square.